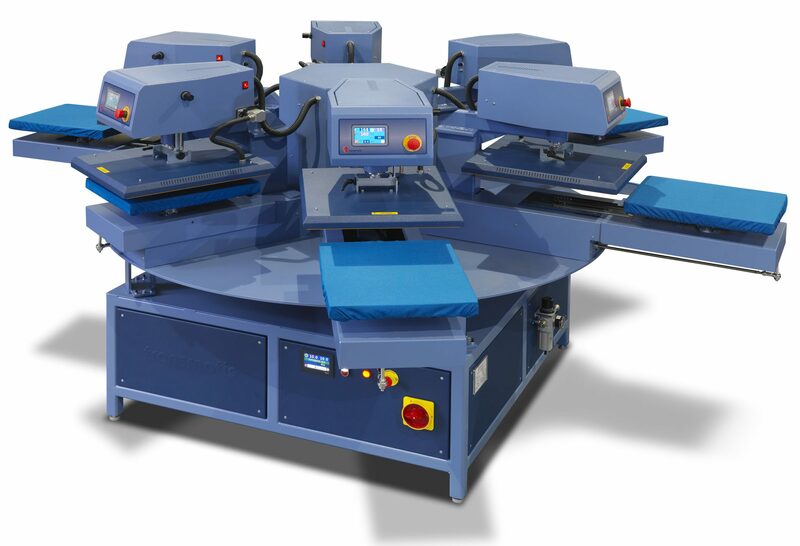 The CA 1000 Carousel Heat Transfer Printer with 4 or 6 independently controlled pressing stations is suitable to print all kind of heat transfers. Standard plate size is 50x40cm, making this an ideal machine for T-shirt, however other platen sizes are available. Operation by foot pedal or automatic mode with programmable index time. The CA 1000 IS CE certified and will meet or exceed worldwide safety and efficiency standards. The Dual Mode control system is extremely flexible with manual operation by foot pedal or automatic mode with programmable index time. In the automatic mode the rotation speed can be set from 2 seconds to 60 seconds, and the machine will operate continuously by a timer. In the manual mode, the rotation is actuated with a foot pedal by the operator. The direct drive system utilizes a large AC inverter motor with a gearbox. There are no chains or sprockets. Time, temperature and pressure is set individually on each of the six press Heads. The standard carousel has got interchangeable 50x40cm heated heads and bottom plates. Special size plates are available for both top and bottom plates.